When you need to meet military regulations, start with the standard. 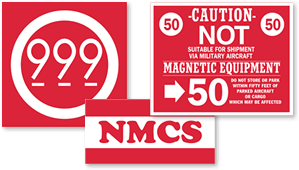 You won't find better quality, US military-compliant labels. Our affordable materials help you effectively meet military regulations, and stick firmly to your packages to alert handlers to safely manage your products. • Displays warning symbols and messages in strict accordance with the military standard. • Bright and attractive, flexographically printed using color-fast inks, for great durability. • Peel off the liner and apply the label on nearly any packing material. • Scuff-proof and remain unaffected to weather abuse, moisture and chemicals.